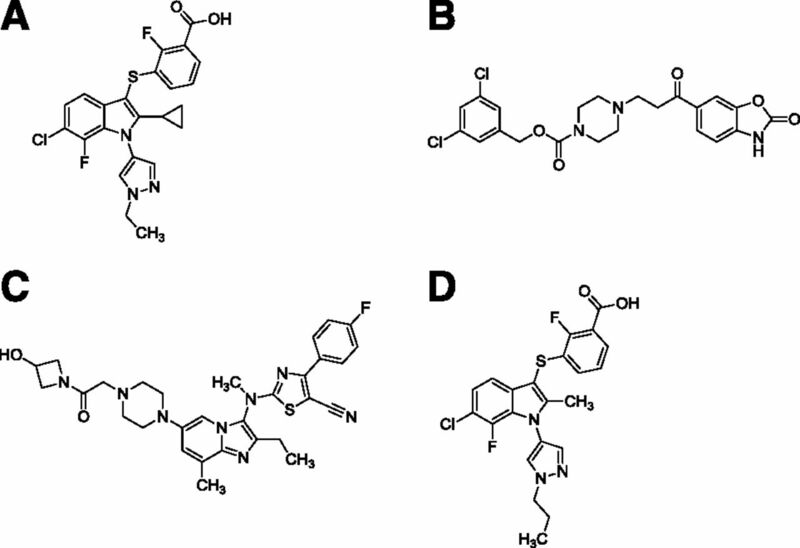 Chemical structures of PAT-505 (A), PF-8380 (B), GLPG1690 (C), and PAT-048 (D). Schematic diagrams for the study designs of the mouse acute CCl4 PK/PD model (A), the mouse STAM NASH model (B), and the mouse CDAHFD NASH model (C). For the acute CCl4 PK/PD model, male BALB/c (n = 8/group) mice were administered CCl4 intraperitoneally at time 0 hours. PAT-505 was administered orally at either 8 hours or 22 hours after CCl4 administration for determination of drug concentrations and ATX activity at approximately trough and peak drug concentrations, respectively. Blood and liver were collected at time 24 hours. (B) For the mouse STAM model, animals (n = 6–8/group) were injected with streptozotocin 2 days after birth then fed a high-fat diet starting at 4 weeks after birth. PAT-505, vehicle or the positive control (telmisartan) was dosed from weeks 6 to 12, and blood and liver were collected at week 12. In the CDAHFD NASH model, animals (n = 7–10/group) were CDAHFD fed for 12 weeks with dosing of PAT-505 (or vehicle) starting after 5 weeks of CDAHFD feeding. Blood and liver were collected at week 12. BID, twice a day; HFD, high-fat diet; QD, daily; STZ, streptozotocin. 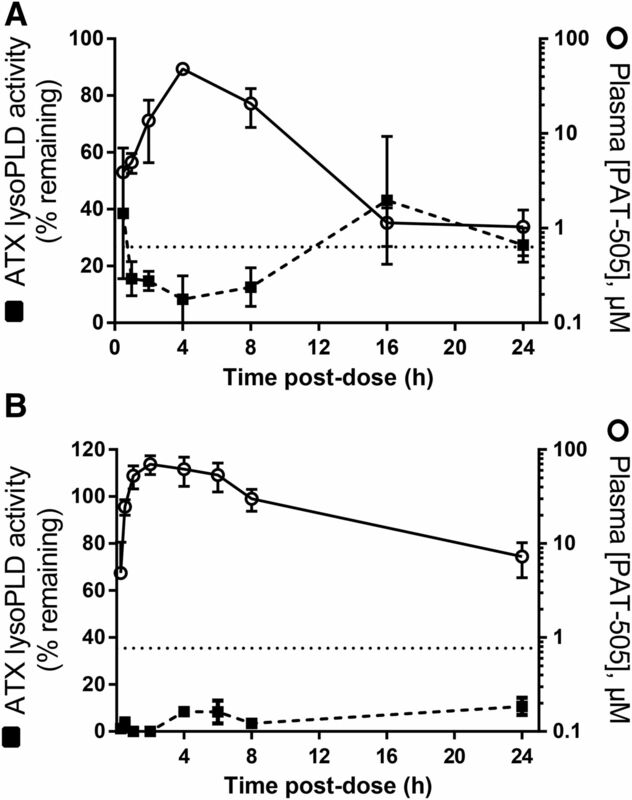 Effect of PAT-505 on in vitro and ex vivo ATX lysoPLD activity. Concentration–response curves for the inhibition of ATX lysoPLD activity in the Hep3B TOOS assay (A), the human blood assay (B), and the mouse plasma assay (C). Data represent the mean ± S.E.M. of at least three independent experiments. Substrate/velocity curves and alpha value (D) for ATX lysoPLD activity in the presence of varying concentrations (0.5X–4X the IC50 value) of PAT-505. (E) Plots of Km and Vmax values versus inhibitor concentration. The Km and Vmax values were derived from the substrate/velocity curve shown in D.
PK/PD profile of PAT-505 in mouse and rat. 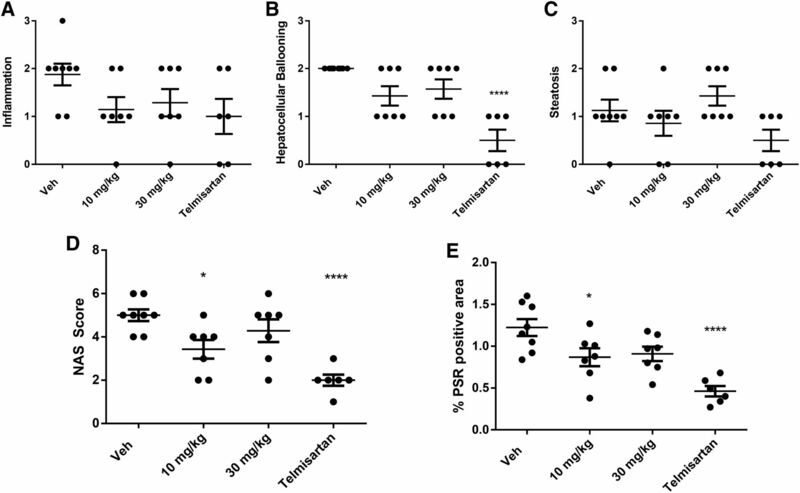 PAT-505 plasma concentrations and plasma ATX lysoPLD activity were analyzed at various times (0.5–24 hours) after a single oral administration of PAT-505 to (A) mice (30 mg/kg, n = 3/group) or (B) rats (10 mg/kg, n = 3). Plotted is the mean ± S.E.M. The dotted line represents the in vitro plasma IC90 value from the mouse and rat assays (∼630 nM and ∼770 nM, respectively). 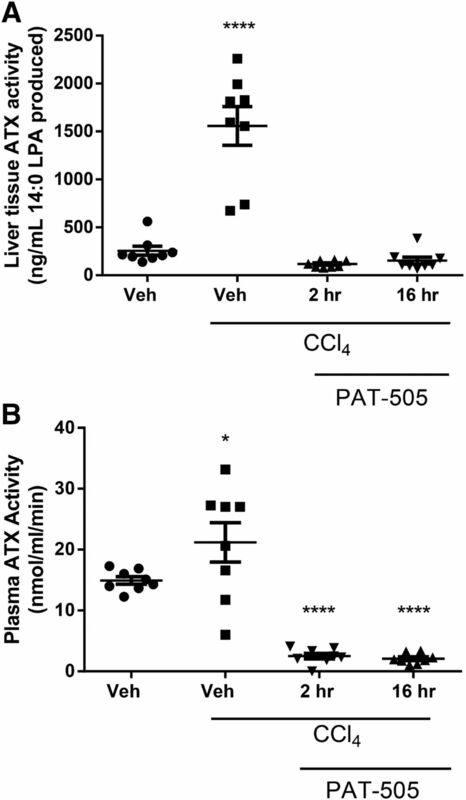 Effect of PAT-505 on in vivo inhibition of ATX lysoPLD activity in plasma and liver. Mice (n = 8/group) were injected intraperitoneally with CCl4 and then administered a single oral dose of PAT-505 at either 2 hours or 16 hours before harvest. Blood and liver were collected 24 hours after CCl4, and ATX lysoPLD activity was evaluated in plasma and liver homogenates. Plotted are the individual values for each animal with the mean ± S.E.M. indicated. Significance relative to vehicle (Veh) is noted with asterisks. 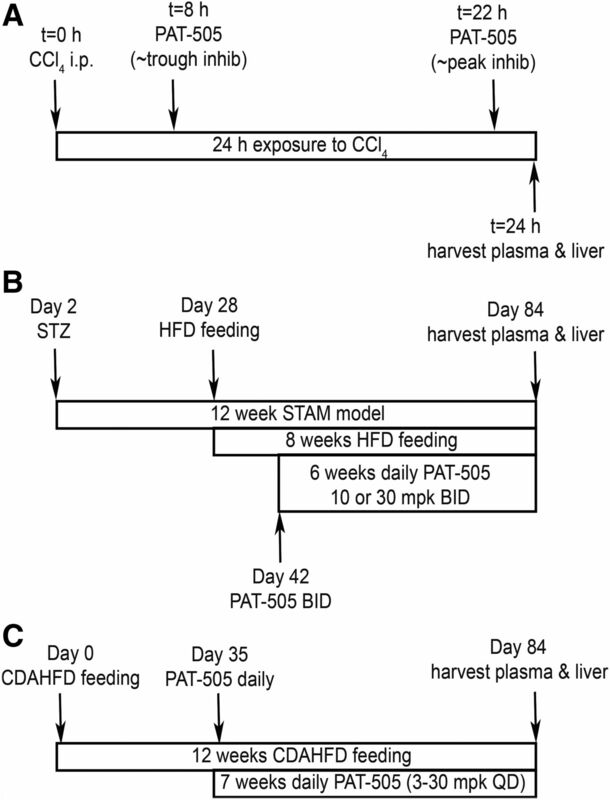 Effect of PAT-505 treatment on hepatic steatosis, inflammation, and fibrosis in the mouse STAM NASH model. Mice (n = 6–8/group) were injected subcutaneously with streptozotocin (STZ) and then fed a high-fat diet. PAT-505 at 10 or 30 mg/kg twice daily or telmisartan at 5 mg/kg was dosed daily from weeks 6–12, and blood and liver were harvested at week 12. Histopathology of H&E-stained liver sections was used to score hepatic inflammation (A), hepatocellular ballooning (B), and steatosis (C). The nonalcoholic fatty liver disease activity score (NAS) score (D) represents the composite of the steatosis, inflammation, and hepatocyte ballooning scores. (E) Quantitation of PSR-positive area from PSR-stained liver sections. Plotted are the individual values for each animal with the mean ± S.E.M. indicated. 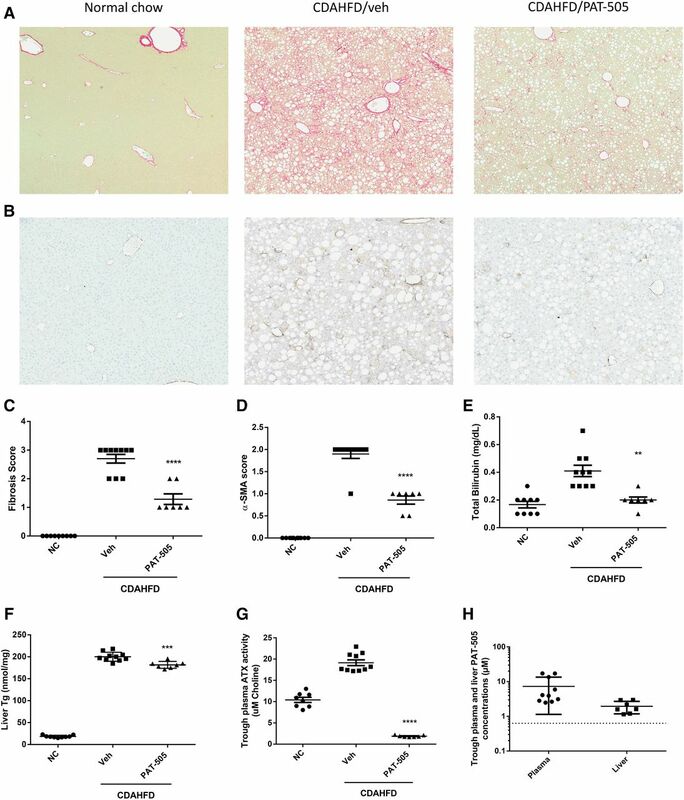 Effect of PAT-505 treatment on hepatic steatosis, inflammation, and fibrosis in the mouse CDAHFD NASH model. Mice (n = 7–10/group) were fed a choline-deficient diet containing 0.1% methionine and high-fat for 12 weeks. PAT-505 at 30 mg/kg was administered orally once daily from weeks 5–12, and blood and liver were harvested at week 12. Representative PSR-stained liver sections (A) that were used to generate the fibrosis score data (C) and anti-α-SMA-stained liver sections (B) that were used to generate the α-SMA score data (D). (E) Serum bilirubin concentrations and (F) total liver triglyceride concentrations. Plasma ATX activity (G) and plasma and liver PAT-505 concentrations (H) at 24 hours after the last dose. Dotted line in (H) represents the IC90 concentration for inhibition in the in vitro mouse plasma assay. For C–G, plotted are the individual values for each animal with the mean ± S.E.M. indicated. For H, plotted are the individual values for each animal with the mean ± S.D. indicated. NC, normal chow; Tg, triglycerides; veh, vehicle. All IC50 values shown are the geometric mean (nM) x/÷ geometric standard deviation with the n values indicated in parentheses. AUC, area under the curve; C0, initial concentration t; Cmax, maximum concentration; ClPl, plasma clearance; t1/2, half-life; %F, oral bioavailability; Tmax, time of maximum concentration; VDss, volume of distribution at steady state. All values represent the mean ± S.E.M. ALP, alkaline phosphatase; ALT, alanine transaminase; BR, bilirubin; Tg, triglycerides. ↵b P < 0.001 vs. CDAHFD/Vehicle. Supplemental Data - 8 supplemental figures, 2 tables.